So the reason we’ve trekked from New Orleans to St Louis wasn’t just to see a whole lot of American farmland that looked remarkably like farmland in Australia. The main reason was to meet up with Shannon, a lovely lady I’ve been friends with online since about 2001? Maybe 2002? A long, long time, anyhow. We met via other online friends and … well, it’s a long story, but essentially we’ve been in touch via the internet for a long time and I was very excited about catching up. 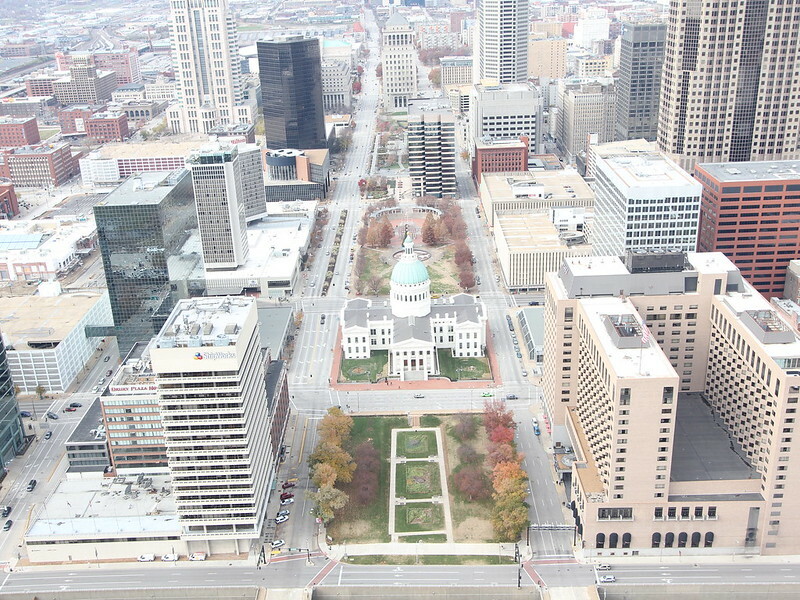 Luke and I arrived in St Louis on Friday evening and realised it was cold. Seriously cold. Literally freezing in fact. After dropping off the hire car and deciding that yes, taking a taxi four blocks was a worthwhile investment, we hid in our hotel room until the following morning. Shannon arrived just before 11am with her husband, William, and son, Will. They live a couple of hours away in a very small town that Shannon assured me was nowhere near interesting enough for us to spend much time, so she offered to come to St Louis, where she’d lived for some time. We jumped in their car and made straight for the pride of St Louis, The Arch. It’s a massive structure, built a long time ago … for… a reason I can’t remember. But it is known as the gateway to the west – St Louis was the mustering point for many expeditions by pioneers in the early stages of settlement. Within the arch is a lift system of tiny pods that take you up to the top – over 1000 steps in height. The view from the top is great, even if the whole experience is a little cramped. Even the room at the top has quite a low roof and tiny windows. Well worth doing if you’re in the city though. Underground, where you enter the lift system, there’s a free museum as well. After the Arch we visited an interactive science centre that was also free and very hands-on. Will is a big animal fan and enjoyed all the exhibits. Luke and I stayed on to watch a movie about the international space station in the omnimax while Shannon and co went to check into their hotel and let Will have a rest. Oh, I forgot to mention that during the day we went to White Castle, a take-away chain that sells the smallest hamburgers I’ve ever seen. They were a little like the ‘squishy burgers’ Luke and Lucas loved in Turkey. 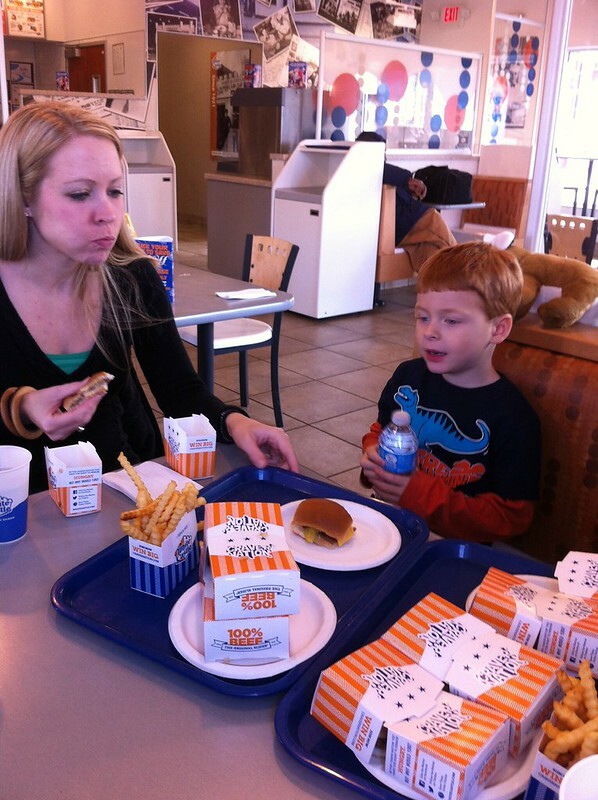 We ordered multiple burgers each… it was really odd! Sorry about the mid-chew photo, Shannon;). Tiny burgers are called ‘sliders’ here. In the afternoon Shannon came back to get us then kindly took us shopping to buy proper coats. We only had the coats that we’d had made in Vietnam, which were wool but nowhere near warm enough. I bought a thigh-length coat that had a layer of stuff that reflects body heat. It seemed quite thin but has worked pretty well. Luke got a smaller jacket without a hood but it’s puffy like a quilt and he says it’s warm. With our new clothing causing us to whine about the weather 50% less than before, we were prepared for spending a little time outdoors. So after dinner (we tried deep fried ravioli!) we drove to the Budweiser Brewery. Budweiser puts on a huge display of lights over Christmas. I completely failed to capture this with my camera, but I do have a photo of Shannon, William and Will huddling under blankets in the back of the little train that drove us around. They’ll tell you Will has one of those monster hats too but it’s just an excuse. By this stage the temperature was about -10 celcius. Which is waaaaaay colder than Melbourne ever gets. The new coat helped, but only having lycra leggings on did not. My gloves also failed to keep out the cold. Inconceivable! Shannon and William dropped us back at our hotel at about 9pm. 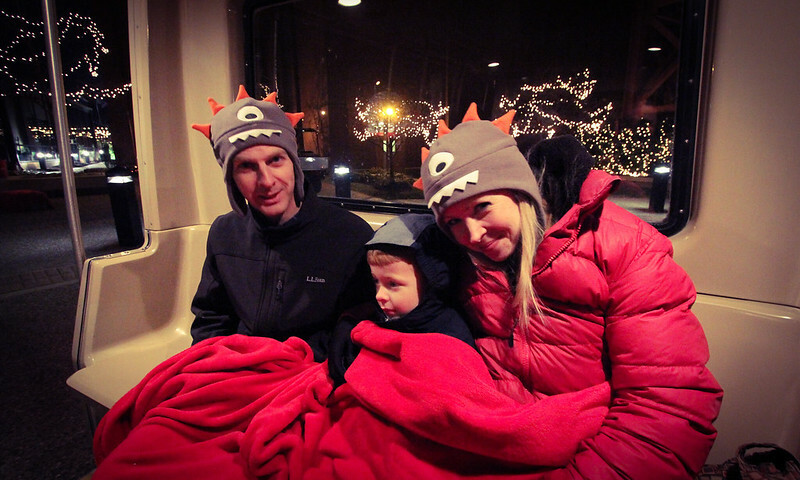 I do like hanging out with families – I get to have an early bed time without having to make excuses ;-). The next day we went to an amaaaaaazing place. 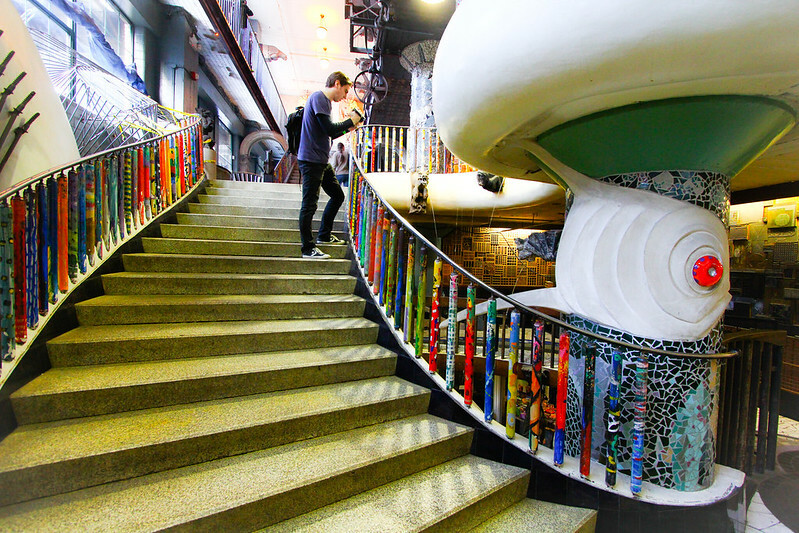 Not that you’d guess from the name – the city museum. Sounds boring, huh? Well it was like nothing I’d ever seen before. Built into (and out of) a big warehouse building, it had a very plain exterior from most sides, but it was incredible – you walk into a child’s wonderland. 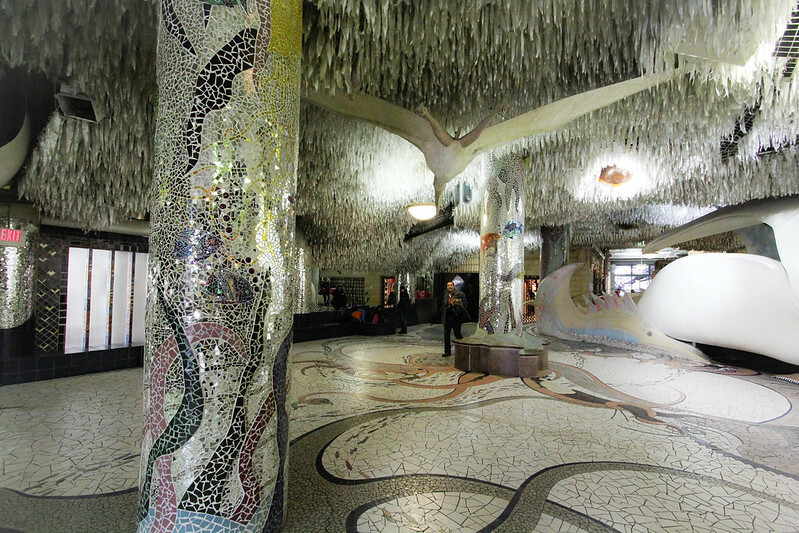 Very reminiscent of Gaudi works in Barcelona. All those metal cages and swirls can be climbed through. Caves to crawl through, trees to climb, animals to wiggle through and all kinds of metal tunnels and ladders. Adults are allowed too but some of the passages are definitely child-sized. There’s plenty of slides – one of them is 10 stories high! So pretty! 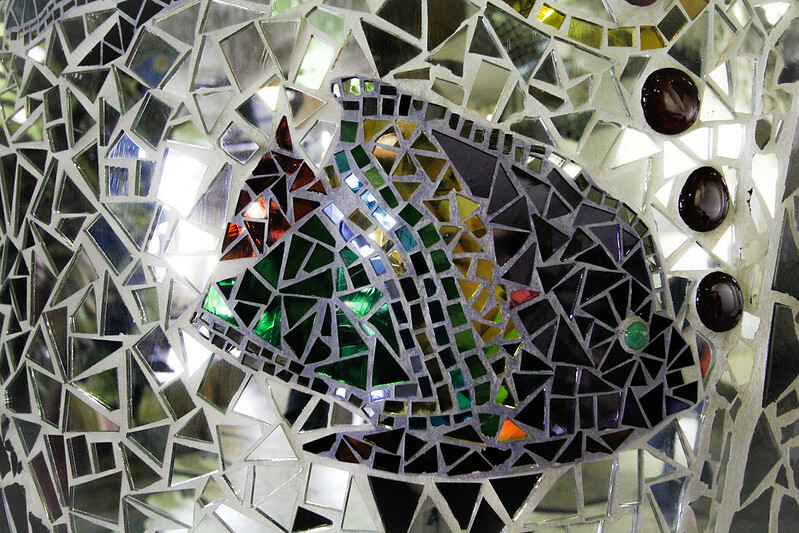 And nearly everything seemed to be made of repurposed materials. 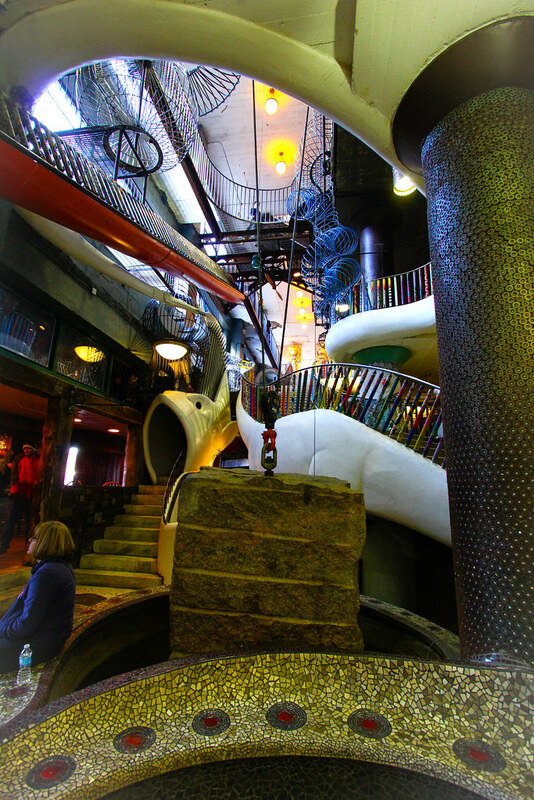 The adventure playground section is two stories. 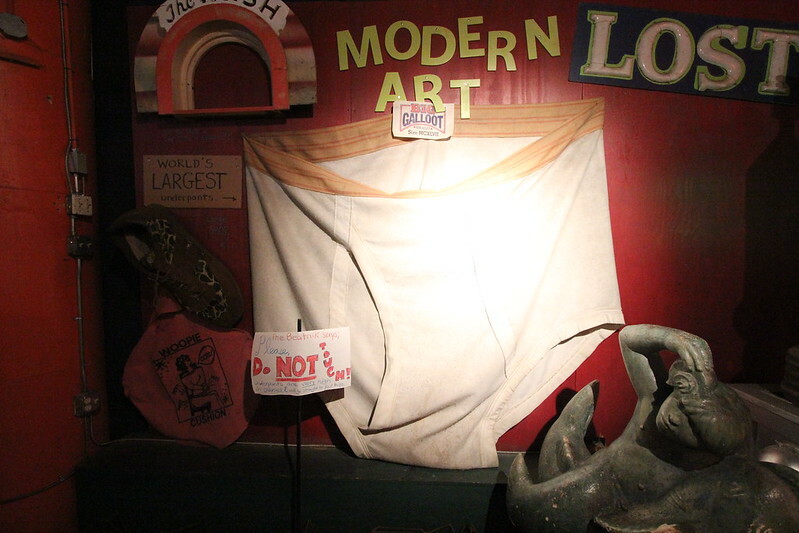 Then there’s an archeological section, a hands-on art section (my favourite), a pinball arcade inside a room full of really weird stuff – including the world’s largest underpants (allegedly). 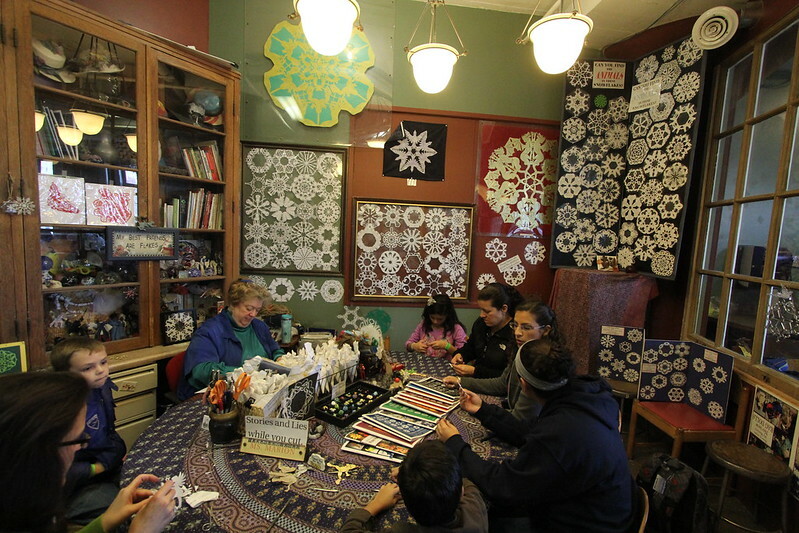 The art room. 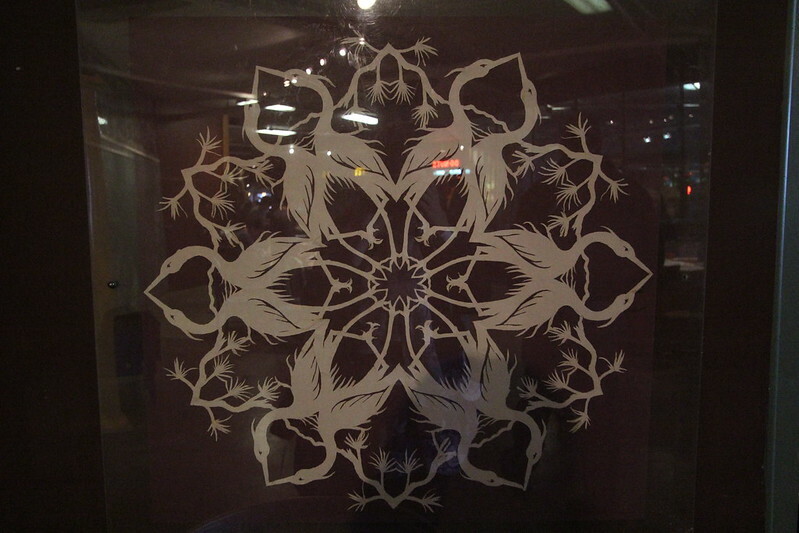 I bought two books of snowflake patterns – animals and dinosaurs. 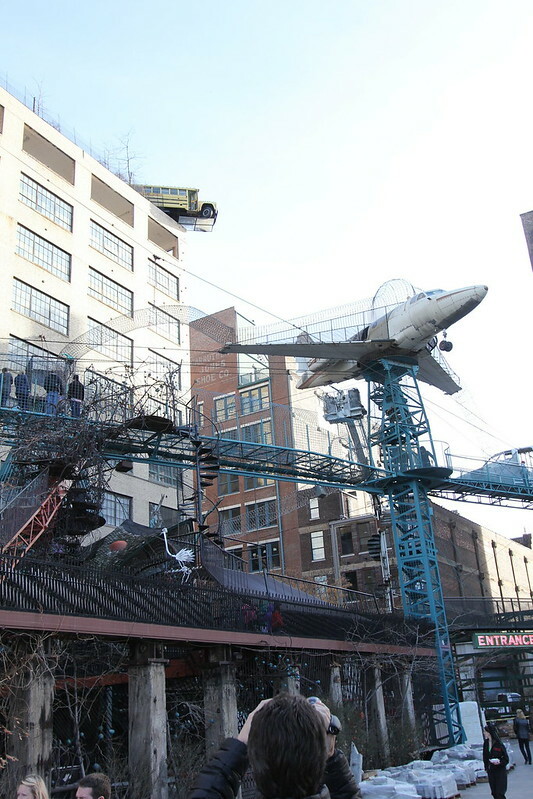 There’s huge ball pits outside, a school bus lurching over the roof and a plane. They look like they’re in the middle of building a castle in the grounds too. The pylons and floors are covered with mosaics and interesting objects.. the place is full of art and very hard to describe. There’s a model train village with a bigger train you can sit in that takes you through a UV landscape. And a circus with children performing acrobatics and juggling. There’s lots of little spots to eat and even a bar for adults. Shannon said that at night teenagers come in and hang out and climb all over everything too. I am completely jealous of St Louis – every town should have a place like this, where exploration and discovery and imagination are promoted. 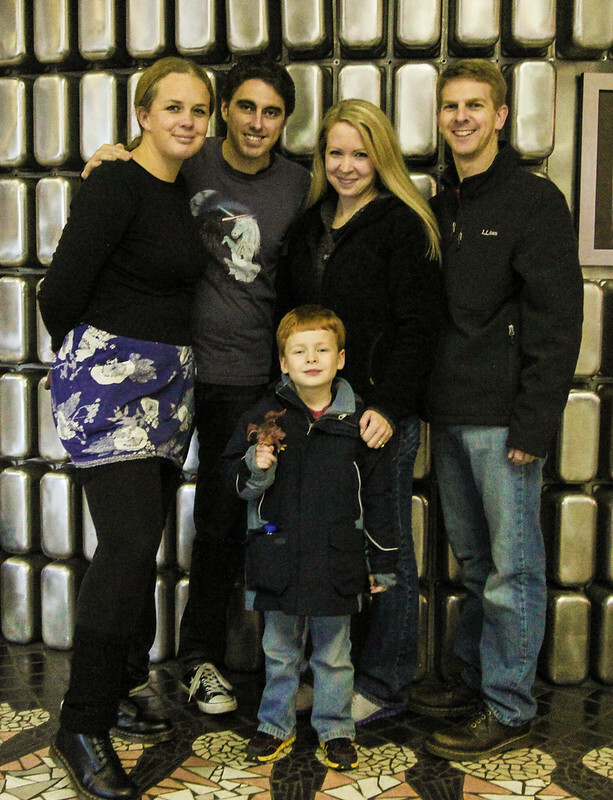 Thanks Shannon, William and Will, we had a brilliant time :-). If you pay the entry fee for your visit to The Cloisters (you can choose not to donate, but if you do I think it’s about $27) then you get free entry to the Met on the same day. So after catching the slow, slow bus from the stop outside The Cloisters (if you are reading this and thinking of doing the same thing I urge you to take the slightly longer walk back to the subway as the train is about 3 times faster) to Central Park, where the gallery is located. If you catch the train you get more time to see the gallery and also leave it before the closing time of 5:30, which is when twenty million people hit the streets of New York trying to get home. I recommend not trying to use the subway during peak hour unless you like being rammed up against strangers. Which probably does appeal to some people but they’re the ones making it even less appealing for the rest of us. On arrival, the facade of the building is extremely impressive and imposing – very similar in some respects to the British National Gallery. Unlike the BNG though, there is a solid line of hot dog vendors right out the front. The Met houses a huge and diverse collection of art. After looking at the map we (Sean, Luke and myself) agreed on a meeting time out the front and then wandered around, heading for the things that most interested us. My strategy with galleries is generally to walk into each room, pick one or two works in each that catch my eye and spend a bit of time studying those, rather than trying to see every work in detail. If it coincides with the placement of a bench, all the better;). Our first stop was the armoury. 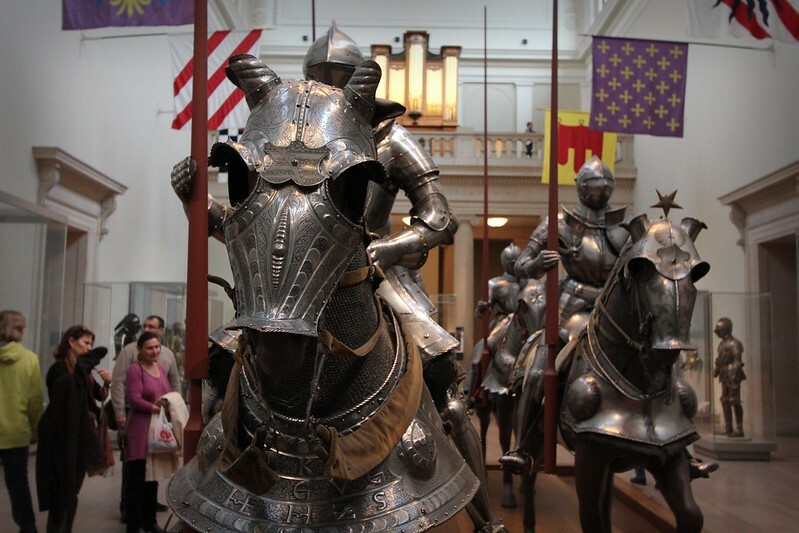 There were suits of armour, both dress and field, for people and several suits of horse armour. There were a few Japanese suits and even one Indian. 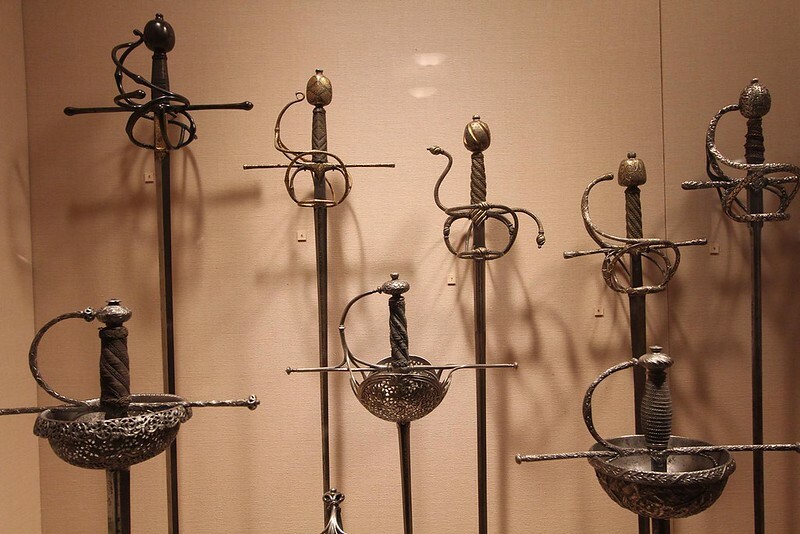 Lots of swords, guns and other pieces made it a very interesting display. My name is Inigo Montoya! You killed my father – prepare to die! Next Luke and I wandered to the Japanese section. 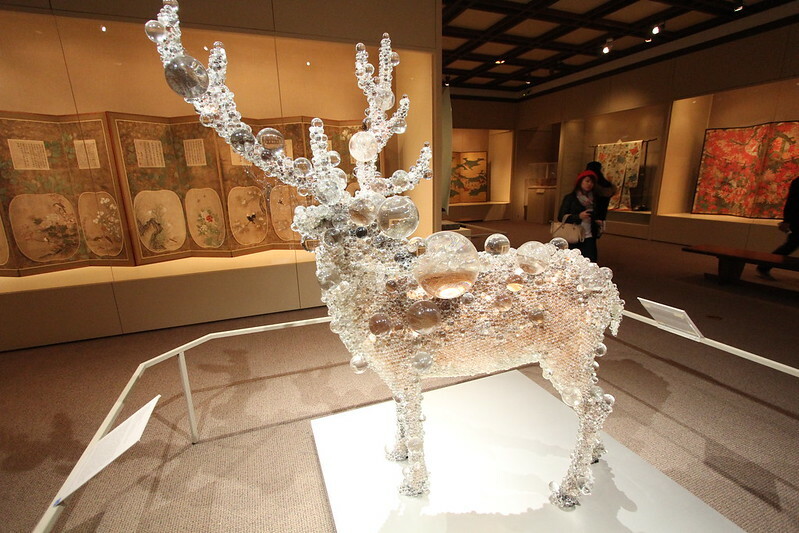 There we found my favourite single piece of the day, a taxidermied deer encased in clear glass spheres. It looked a little like a giant Christmas tree decoration, very light and ethereal. I don’t generally find Asian art very interesting (old art, I mean – new is a whole different story) and there were many examples of calligraphy, which are hard to appreciate without some sort of background knowledge. It was a shame there were no textiles displayed because I really love Asian fabric designs. Don’t ask me what it means. Next we moved onto the modern American artists and they were brilliant. I don’t remember the names of any of the artists but there were many stunning paintings in realist and impressionistic styles. The names of art periods in the US seem to vary from Europe so I’m not entirely sure what to call them but there were incredible portraits and landscapes that Luke and I both admired greatly. We had a bit of a chat with one of the guards about how the gallery moves paintings that are bigger than any of the doorways. I didn’t realise oil paintings rolled up so easily. We walked quickly through the post modern and ancient art sections and the only other art that really sticks in my mind was a very large Tiffany window that was a rainbow of colours and depicted a fantasy landscape scene. The gallery had it mounted so it was back lit and very impressive… almost gaudy in fact. By the end of the day my feet were absolutely killing me. There’s something about shuffling around galleries that makes my feet more tired than walking many more kilometres at a fast pace. In fact I’m finding New York has been harder on my feet that anywhere else we’ve been. My ankles, for the first time in my life, are starting to ache every day and I think it’s from rushing up and down all the concrete subway stairs. Then last night we were one of the last groups into a comedy show and had to stand for the whole thing – after being on our feet since lunch time. I think I spent about 10 hours on my feet that day. I used to do that at work nearly every day (I’m a teacher) but not having any carpet to soften the blow makes a huge difference. Anyway, we’ve lain in bed half the morning today. Hopefully that will help!